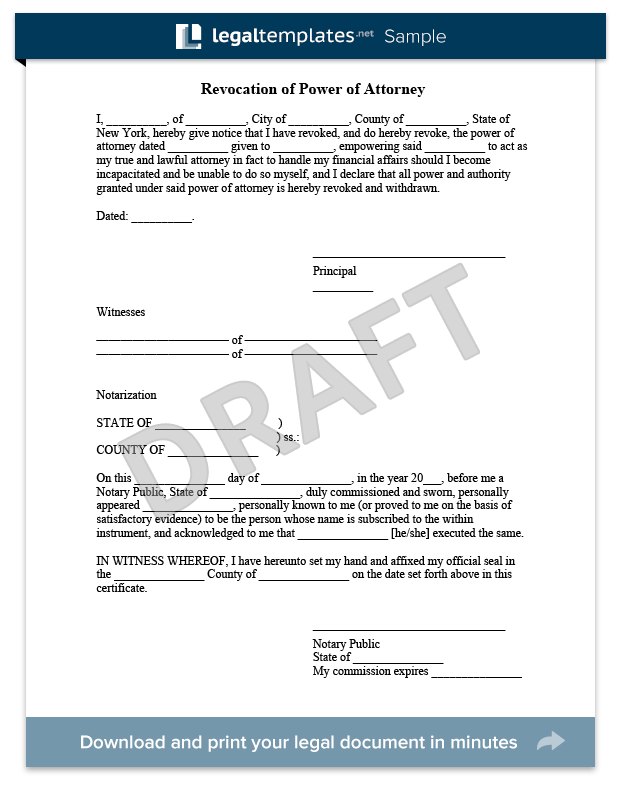 Use our attorney-drafted Revocation of Power of Attorney document to revoke and cancel a previously created Power of Attorney. The Basics: What is a Revocation of Power of Attorney? What Happens If You Do Not Revoke a Power of Attorney? Since you as the Principal are legally responsible for the acts of your Agent, a Revocation of Power of Attorney similarly allows you to change your Agent. 2. The Basics: What is a Revocation of Power of Attorney? This legal form allows you to change your mind about who you want to act on your behalf for personal, business, or legal matters. As the name suggests, you can revoke or cancel the power and authority previously granted to an Agent. Just as a Principal can create a Power of Attorney (POA), a Principal can also revoke that same power. Once you sign this legal document, the former Agent no longer has authority to act on your behalf. Be sure to notify other individuals or institutions who have the POA on record of this change. The sample revocation of power of attorney below details an agreement between the principal, ‘Billy D Almon’, and the attorney-in-fact, ‘Sandra C Cochran.’ Billy D Almon agrees to rescind the power given to Sandra C Cochran as his attorney-in-fact. Remember that a Medical Power of Attorney allows you to name someone to make health decisions for you in the event that you are incapacitated. According to a November 2012 report by the U.S. Government Accountability Office (GAO), older adults are particularly prone to being financially exploited by ill-meaning POA agents. Fortunately, you can use a Power of Attorney Revocation to undo a bad appointment of an Agent and prevent elder abuse. A 2012 documentary, Last Will and Embezzlement, features Mickey Rooney and the potential for a POA to be abused by untrustworthy Agents. An April 2015 guide from the Consumer Financial Protection Bureau (CFPB) provides help for agents under a POA. 4.What happens if you do not revoke a Power of Attorney? If you do not cancel your previous Agent’s POA, the wrong person may have legal authority to act on your behalf in important financial and business decisions.